Dense jungles, wild animals and exotic flora will be your introduction to Borneo on this cycling holiday. Rivers, mountains, and beaches are to follow as we bike on dirt and tarmac roads across the north of Borneo. This trip starts off where the wild things are. We cycle to and spend two nights in the midst of Malaysia’s largest wildlife reserve, where you are sure to sight monkeys and a teeming birdlife. Next, it’s on to a boat to cruise through the mangroves of the Kinabatagan River and hopefully sight proboscis monkeys, found only in Borneo. To see proboscis and orangutans up close, we’ll go to two different sanctuaries before we switch tracks and cycle off road following part of the Sandakan Death March route. Then, from our position up high with spectacular views of Mount Kinabalu, we descend to the stunning coastline and are rewarded for all our efforts with a night at a luxurious resort. Meet in Kota Kinabalu for a welcome dinner and trip briefing. Fly to Lahad Datu where we start our ride on a rolling dirt road to the Ta-bin Wildlife Reserve, looking out for one of the nine species of primates that inhabit the area. We then take an evening jungle trek to catch the nocturnal life around us. Take a morning walk to discover some of Tabin's exotic bird species. After breakfast, we cycle on dirt roads to active and mineral-rich mud volcanoes that attract wildlife for their mineral intake. The afternoon is free to enjoy your balcony or to wander to Lipad Waterfall. Cycle out of the reserve, perhaps catching a last glimpse of an orangutan or a horn bill. We then transfer to Bilit, arriving early enough for a late afternoon boat ride on the Kinabatagan River to spot proboscis monkeys. We ride to the Gomantong Caves, a source of birds' nests, a prized Chinese delicacy. We then transfer to the Sepilok Orangutan Rehabilitation Center and meet the locals. We start with a visit to the Labuk Bay Proboscis Monkey Sanctuary. Then we have a scenic late afternoon ride through the Heart of Sabah. Today's riding is quite hilly and off the beaten path. We cross quite a few small streams before we transfer to the Sabah Tea Garden. There is some great off-road cycling around the tea plantation, taking in great views of Mount Kinabalu. After touring the tea factory, we have an undulating cycle to the countryside of Ranau. We reach the location of a WWII POW prison camp and visit the memorial. Enjoy the quiet country roads as we ride through orchards and rice fields before ending at our charming home stay. Today's ride is tough, because as soon as we go down, it's back up again, all on dirt roads. We ride in the shadow of Mount Kinabalu, which rises to 4,095 m and dominates the landscape. We leave the cool mountain air for the warmer coastal plains. We ride across a magnificent suspension bridge and visit a Chinese temple with a pagoda tower before arriving early afternoon at our luxurious resort. Transfer to Kota Kinabalu Airport..
Day 2 - Kota Kinabalu – Lahad Datu – Tabin Wildlife Reserve Ride 26km. +477m / -447m. Amazing grounds team, nothing was too much trouble. Incredible local and historical knowledge. Excellent, friendly and supportive guides. A great balance of riding and enjoying the wildlife, culture and food. Suitability: The beginning of this ride is relatively flat, and the riding gets hillier towards the end of our adventure. Although distances are not huge, the heat and humidity of equatorial Sabah ensure things feel hot. This is a journey through the finest terrain and scenery of North Borneo, with the best in nature and wildlife, ensuring you get the very best of everything from your cycling efforts. Biking Conditions: The road surfaces are mixed: most days we ride on a mix of dirt and bitumen roads, though there will also be some good quality tarmac roads. There are enough rides on dirt tracks to mean you will need a mountain bike, and preferably one with front shocks. However, there is nothing technical involved on this tour, but some off-road riding experience will make this trip more enjoyable. A support truck is available most of the trip to help, though there are a few sections where we will have limited support. Welcome to Kota Kinabalu, the capital of the State of Sabah. After transferring from the airport, check in and rest before we meet for a welcome dinner and trip briefing at a traditional local restaurant. A morning flight takes us across Borneo to Lahad Datu, and once back on terra firma, we have breakfast before we start our cycling. It’s a quick drive to our starting point, and after making sure the bikes fit, we begin our ride on a rolling dirt road to the Tabin Wildlife Reserve. We overnight in the middle of 123,000 hectares of tropical flora and fauna. This rainforest is also home to more than 220 species of birds, the three largest mammals of Sabah -- Borneo Pygmy Elephant, Sumatran Rhinoceros and Tembadau, nine species of primates, as well as three species of cats. We take an evening jungle trek (weather permitting) to give us a glimpse into the nocturnal life around us. You may opt to wake up early and join a morning walk to discover some of Tabin’s exotic bird species. After breakfast, we cycle on dirt roads to the Core Area, with more wildlife sightings and a visit to see one of the reserve’s highlights, the active and mineral-rich mud volcanoes, which attract frequent visits by wildlife for their mineral intake. We return for a late lunch at Tabin Resort, and the afternoon is free to enjoy on your balcony, go for a swim in the nearby rock pool or indulge in a foot soaked spa and mud facial. Once the sun has set there is a night drive to spot more wildlife. After waking up to the sounds of the jungle, we cycle on a dirt track out of the reserve, hoping to catch one last glimpse of some primates or a horn bill. We then transfer about two hours to Bilit. We arrive early enough to savour a late afternoon boat ride on the Kinabatagan River, where we’ll see the rambunctious proboscis monkeys in their element, and if we are lucky, other wildlife such as orangutans and pygmy elephants. Following breakfast, we start riding from the resort, cycling 8 km off road and then 17 km on a paved road to the Gomantong Caves. Here locals collect birds' nests, a prized Chinese delicacy, three times a year. The harvesters climb up to 100 m on rattan ladders to collect the nests of the resident swiftlets. We then a transfer to Sepilok to visit the orangutans at the Sepilok Orangutan Rehabilitation Center. After watching these mischievous apes eat and play we'll check in to our nearby resort. Morning wake up and breakfast, then a short drive to the Labuk Bay Proboscis Monkey Sanctuary. We arrive in time for a feeding and a chance to see these unique monkeys up close. Time for a 15 km cycle through palm plantations before we transfer for two hours to Telupid. Here we'll check into our hotel and have lunch. After a siesta to beat the heat, we'll go for a late afternoon scenic ride through the district of Tongod, literally, the Heart of Sabah. We begin the day with a short transfer to the Sandakan Death March track, though palm plantations have since replaced much of the jungle that the prisoners struggled through in World War II. Today’s riding will be quite hilly and off the beaten path. We cross quite a few small streams and earn our lunch after 18 km of riding. We transfer to our overnight destination for lunch at the Sabah Tea Garden. After a short rest, we head back out for some great off-road cycling around the tea plantation, following the route of the Sabah Tea Adventure Race, taking in great views of Mount Kinabalu. Tonight, we’ll experience what it’s like to sleep in a traditional Rungus Longhouse. Each room has its own sink; however, hot showers are shared. After breakfast, we tour the tea factory and learn how tea is grown without fertilisers and goes from plant to processed tea. We have a short transfer to avoid the highway, and then it’s an undulating ride on a mix of tarmac and off road that will take us to Poring Hot Springs. Here, you can go for a dip in the therapeutic waters, go for a canopy walk, or hike to a small waterfall. And if you are lucky, a Rafflesia will be in bloom nearby. After lunch, we transfer to Tanah Merah to a POW memorial where we’ll take a break before we enjoy more quiet country roads as we cycle through orchards to our charming home stay. We have the afternoon free to check the internet, do some laundry, or relax on the wonderful porch built over a stream. Dinner will be a treat, with local specialties made by our hosts. Following a traditional local breakfast, we transfer 30 minutes to Kibbas to start our adventure. Today’s ride is tough, because as soon as we go down, it’s back up again. All on dirt roads. We ride through small farms beneath the shadow of Mount Kinabalu, which rises to 4,905 m and dominates the landscape. We head to Kundasang and overnight at a hotel with spectacular views of the peak. We are now leaving the cool mountain air behind for the heat of the coastal plains. We transfer to the district of Tamparuli to start cycling through the countryside and villages. Crossing a magnificent suspension bridge and visiting a Chinese temple with pagoda tower will be some of today's highlights. Lunch will offer up many choices of local dishes. After lunch, you have an option to cycle to the resort or be transferred so that you spend more time relax and leisure in the swimming pool or at the beautiful beach in front of South China Sea. We arrive early afternoon so you can enjoy the resort before we meet up for a farewell dinner. Transfer to Kota Kinabalu airport to catch your outbound flight, or head back up to the top of Kota Kinabalu. **Optional Mount Kinabalu Trek** If arriving early or staying on after, we offer an optional trekking tour to Mount Kinabalu. At 4,100 m, Mount Kinabalu is the highest peak in Malaysia and perhaps the most stunning and iconic mountains in Southeast Asia. Conquering its jagged peaks is an attainable challenge for any fit person and will leave you with a profound sense of accomplishment. Our 2-day/1-night trip is US$730 per person per bed (joint tour). 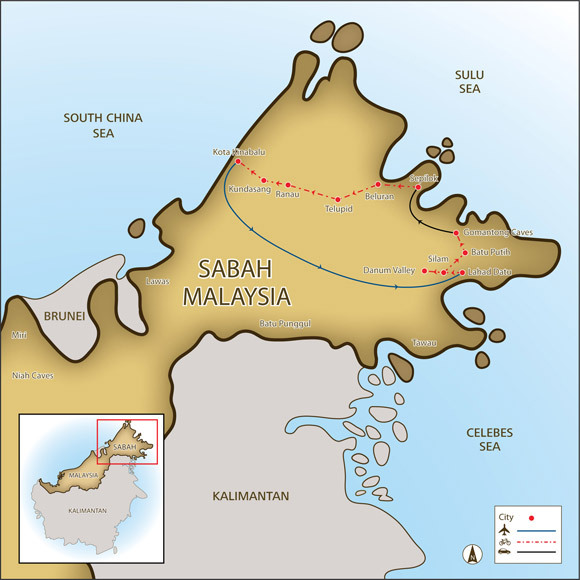 This includes: transfers to and from Kota Kinabalu to park headquarters, guide, climbing fees and permits, mountain bed and blanket, pack lunch and dinner on Day 1, breakfast on Day 2. If you’d like more information, please contact us. Because some people can't imagine going on a trip without their own beloved bicycle, we do not provide them as part of this tour. However, you can hire bikes locally for the price listed in the tour pricing section. The bikes are brand name mountain bikes with lightweight alloy frames, 24- to 27-speed gearing, disc/v-brakes, and Shimano components and front suspension. If you bring your own bike, please make sure it is a mountain bike, preferably with front suspension, in good mechanical order. Please verify that your passport is current and make a photocopy that you can carry with you at all times. Travellers from Australia, the United Kingdom, US and EU do not need a visa to Malaysia for a visit of less than three months. There are no special vaccinations required for Malaysia; however you may want to take Malaria tablets as we will be traveling in Borneo's jungle area. Please check with your doctor prior to departure. The whole of Malaysia has a classic tropical climate and remains hot and humid throughout the year and rain showers occur almost daily. Average temperature ranges from 15°C/ 59F to 25°C/ 77F at higher elevations and 21°C/ 70F to 32°C/ 90F around the coasts, such as Malacca and surrounding areas. The highlands have a distinctly different climate to the rest of Malaysia. Temperatures average a very pleasant 22°C/ 72F in the daytime and a relatively cool 15°C/ 60F at night – an excellent climate for growing tea, flowers and fruit, and for visitors it offers a pleasant contrast to the hotter lowland areas. A typical day consists of blue skies in the morning, showery afternoons and chilly nights, with rainfall at it’s heaviest between September and early December. Borneo has an equatorial climate, which is hot and humid year-round. Average daily temperatures are around 30 Celsius and the humidity can be high. Rain is also fairly common though we have scheduled these tours to avoid the monsoon season. Meals are included as per the itinerary where B = breakfast, L = lunch, D = dinner. Most meals are local Malay food and feature noodles, rice, curries and soups. Any special dietary requirements can also be catered for as well. Please let us know at the time of booking. Keeping you completely hydrated is a job we take very seriously. Cold water, some energy-restoring local fruit and soft drinks are included in the tour price while riding. Soft drinks and other beverages during meals are not included. We are riding in a Muslim country and though beer is available, it might not be served in some halal restaurants where we will eat. If you choose to purchase some beer please note it is NOT included in the price. We recommend that you tuck away a few extra dollars, perhaps US$10, for incidentals. It is customary to tip local tour guides and drivers, however, the amount you give should be dependent on the level of service you receive. As a general guide we suggest US$ 3-4 per person per day is appropriate. The official currency is the Malaysian ringgit (RM). Foreign currencies are not generally accepted. The airport is the best places to exchange money. ATMs are widely available in cities and towns, but you’ll need cash in villages and in the jungle. Credit cards can be used only in larger hotels.